@hamasaki: Have you posted this on their forums? There's an active community, maybe even the dev responds if it's a bug. Been using it for over a year now and the only glitch I see is with playing random tracks. I have thousands of songs / albums, but for some albums, it only ever appears to select the same track and it never plays antyhing else. Looking at the stats on LastFM confirms this. It`s randomnly selecting the same tracks too many times. For me this is the best music player. Has all the features I need, is fast, reliable and has plenty of customisable options. Excellent. For file tagging I prefer Tag Scanner but the tagging and audio conversion features of foobar2000 are quite convenient and adequate enough most the time I forget about using Tag Scanner. Comparable to WMP, iTunes and others, The lack of multi-media handling (audio / video / etc) has become it's Achilles hill. But I haven't found a better performing and customizable replacement, so I'm quite happy foobar2000 for the time being. The more I use foobar2000, the more I love it. foobar2000 has excellent tagging features as you can connect to freedb / Discogs (via foo_discogs) and it will tag your music for you. You can also rename your files based on your tags as well. This basically eliminates all those MP3 tagging / renaming programs. Combine that with its excellent processsing and conversion capabilities and this one program can replace all your music utility programs! Keep finding new things I love: if you choose one of the layouts with "Properties" included, you get access to a "View" window that lets you swap quickly between artist, folder structure, and genre. In order to quickly find the music you want in larger collections, its often necessary to jump between these different settings. Foobar does this easily and instantly. @abc: to be honest, I haven't got too much difficulties when a program is english only, although I prefer my own language if there's a good translation. But for the developer no localization means less bug reports, less suggestions, less collaboration (skins, icons, plugins, even code)... and less donations. Foobar2000 is the undisputed king of audio players. Free, independently developed, frequently updated, completely portable, Linux (WINE) capable, fully customizable, tabbed playlists, small size, tons of features out of the box, can be extended with plugins galore. I agree.. this is irreplaceable! I don't have to splice .FLAC tracks, it's able to use the .cue file .. wow! It can also verify EAC logs, plus many more features/plugins ! Great software, they could easily charge for this. Just discovered this program's ability to update whole album's metadata from FreeDB. No more Song1.mp3, Song2.mp3, etc. Note that it works a whole lot better if you check whole albums rather than individual songs, but its absolutely irreplaceable. I really like Foobar2000 for FLAC, OGG, MP4, M4A, ALAC, MP3, WAV, AIFF, and MID files. It's really cool. I like how it works with the highest resolution WAV files. It's great for editing id tags and converting CD's to FLAC. I loaded up with a bunch of plugins and it's really neat. I customized my interface just how I like it. I use it every day for tons of things. On the downside, this recent version (as of Jan 25, 2011) didnt install correctly because it choked on my plugins. I'm not really sure how to fix it so I just went back to the previous version which still works just fine on Windows XP. It's a nice portable app, however, it does not support relative paths when saving playlists. Saved playlists are with absolute paths as of v1.0.3 Hope they fix it in future versions. A small oversight that greatly diminishes its' usability. It seems to automatically take in relative paths for me. I'm testing it (running off of my Rockbox player) and it's working great so far--didn't crash like songbird yet. Please note that as of v0.9.6.4, the official installer allows installation in portable mode - just select the option for portable install and it will install itself into a folder, with all settings made to an .ini file and no changes made to the registry or host computer. The latest versions allow for configuration of the main window to make it either resemble programs like iTunes and Songbird or to do a minimalism track that many users prefer (ala VLC). The ability to play many formats and the focus on being a purely music-playing software makes it an outstanding, clean player for every taste. Rapidly becoming a genuine Winamp replacement. Oh wow.. I think I found a 1by1 player replacement, which is a great player by all means but it starts slacking with large directories (750+).. So far 10 minutes with Foobar2000 and I'm impressed, time will tell If this becomes my default media player. Juppie :-) Foobar2k 9.6 has been released and does no longer request administrative rights to start the setup under windows vista. UAC fires after choosing to install foobar on the computer and not in portable mode. 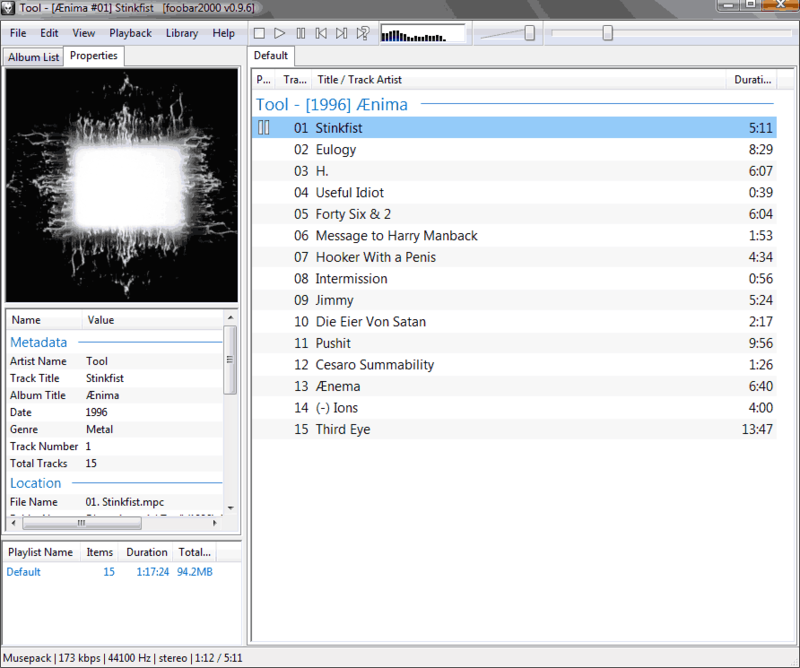 foobar2000 is the best audio that I've ever used. Does everything that I need it to do and well, including handling my iPod. Very highly recommended. Been running it on my portable drive for a very long time now. @Vasily: If you use the "Library" feature to scan your drive for music, Foobar2000 stores the full path in the "Album List" database. However, if you add files to playlists, they are automatically stored in a "playlist" subdirectory of the program directory AND they use relative paths. You can have as many playlists open at the same time as you want. Where I can found more skins for it? Thanks! I use Columns UI, which is a much better interface than default one, and it has an option to minimize to tray (under Preferences->Display->Columns UI->Status bar/Systray). Nice program, I like its features, and its ability to save play lists. However, I wish it had a way to sit in system tray instead of being minimized. Otherwise, its a great program. Foobar starting from v0.9 requires NT, XP or higher. Does not support Win9X or ME anymore. That's why I still keep a copy of v0.8.3 for the older machines.